Lord Rodney01535 603053work Public HouseOn the edge of 'The Green' next to the Parish Church this iconic Keighley town centre inn has been completely rebuilt and transformed into a modern stylish pub. The Rodney has quickly established itself as Keighley’s premier dining experience with an exciting new menu which is complemented by an extensive wine list. All the food is freshly prepared in the state-of-the-art kitchens using local produce wherever possible. On the edge of 'The Green' next to the Parish Church this iconic Keighley town centre inn has been completely rebuilt and transformed into a modern stylish pub. 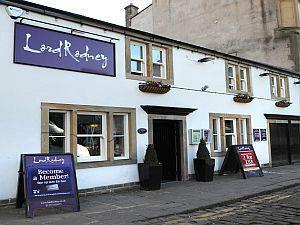 The Rodney has quickly established itself as Keighley’s premier dining experience with an exciting new menu which is complemented by an extensive wine list. All the food is freshly prepared in the state-of-the-art kitchens using local produce wherever possible. Real Fire - outdoor drinking - lunchtime meals - evening meals - wheelchair access - railway station nearby - smoking area - children welcome.